Can academia save the pharmaceutical industry? The pharmaceutical industry is at a crossroads. The urgent need for novel therapies cannot stem the skyrocketing costs and plummeting productivity plaguing R&D, and many key products are facing patent expiration. Dr. Rathnam Chaguturu presents a case for collaboration between the pharmaceutical industry and academia that could reverse the industry's decline. Collaborative Innovation in Drug Discovery: Strategies for Public and Private Partnerships provides insight into the potential synergy of basing R&D in academia while leaving drug companies to turn hits into marketable products. As Founder and CEO of iDDPartners, focused on pharmaceutical innovation, Founding president of the International Chemical Biology Society, and Senior Director-Discovery Sciences, SRI International, Dr. Chaguturu has assembled a panel of experts from around the world to weigh in on issues that affect the two driving forces in medical advancement. Discover how industries can come together to prevent another "Pharma Cliff"
Dr. Chaguturu’s thirty-five years of experience in academia and industry, managing new lead discovery projects and forging collaborative partnerships with academia, disease foundations, nonprofits, and government agencies lend him an informative perspective into the issues facing pharmaceutical progress. 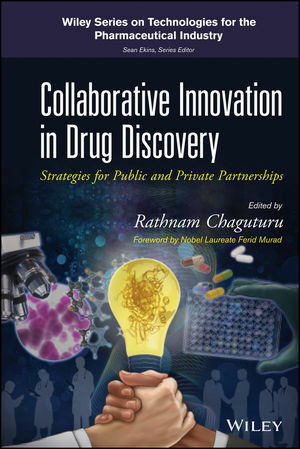 In Collaborative Innovation in Drug Discovery: Strategies for Public and Private Partnerships, he and his expert team provide insight into the various nuances of the debate. RATHNAM CHAGUTURU, PHD, is the Founder & CEO of iDDPartners, a nonprofit think-tank focused on pharmaceutical innovation. He has more than thirty years of experience in executing new lead discovery projects and forging discovery partnerships. He is the Founding President of the International Chemical Biology Society and Editor-in-Chief of Combinatorial Chemistry and High Throughput Screening. He serves on several other editorial and scientific advisory boards along with NIH Study Sections, is the recipient of several awards, and is a much sought-after speaker at major national and international conferences, passionately advocating the virtues of collaborative partnerships in addressing the pharmaceutical innovation crisis. Governments will always play a huge part in solving big problems. . . .
No one can whistle a symphony; it takes a whole orchestra to play it.